I was able to get one in today before I leave for the West Coast. This picture actually appears in the 1949 35th Anniversary Conclave Journal. However, the picture attached is from the collection of Bro. Francis L. Hall. The Brothers from Alpha Sigma Chapter present Mr. Donald Tignor (son of Bro. Madison Tignor -Alpha Chapter 1919) with the Phi Beta Sigma National Essay Scholarship Award. I believe the award was $100, which was good money in those days. From Left to Right: Bro. Joe Battle, Bro. Francis L. Hall, Bro. Judge Hebert Pair, Mr. Donald Tignor (Winner), Dr. Alphonzo J. Harris, and Bro. James Squires (Squires Club). 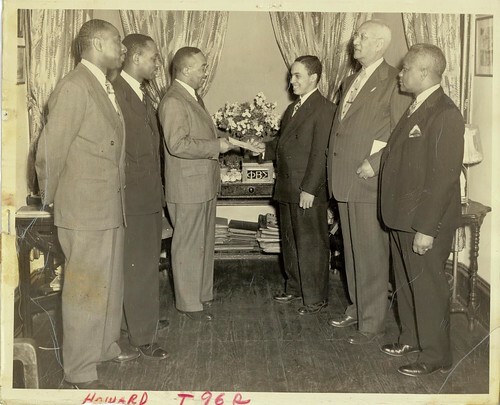 Today in Sigma History – November 6, 2007 – 1949 Phi Beta Sigma National Essay Contest Winner.